You’ll find that each of the iWork apps on the iPad has a similar look and feel. One of the coolest advantages of iWork is that major features — not just small operations such as changing a font or selecting a color — are available using the same method in all its apps. You have only one set of features you must understand when you’re using iWork. The iWork apps (like all apps) are updated periodically. If an update is available, you see the App Store on your iPad Home screen with a number indicating that downloads are available. It’s generally a good idea to update your iWork apps when updates are available so that their interfaces remain in sync. Recent updates have included the addition of 3D charts in Numbers, a new animation and new transitions for Keynote, new templates, and optimization to take best advantage of the third-generation and later iPads’ Retina display. Tap any of the iWork app icons to launch the application. The Documents screen appears. 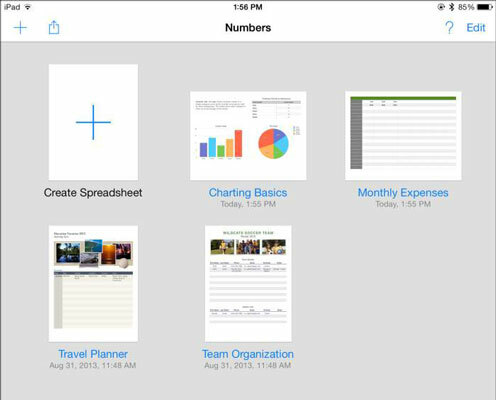 This screen is titled Pages in the Pages app (see the figure), Spreadsheets in Numbers, and Presentations in Keynote. Note that when you first open an iWork app, you see a single document that contains basic information and instructions for that app. After that, if you create and save any documents, they will also display on this screen. If you see Documents on the button in the top-left corner while in Pages, you’re not on the Documents screen; you’re on the screen for working with an individual document, and tapping Documents (or Spreadsheets in Numbers or Presentations in Keynote) brings you back to the Documents screen. Tap the plus sign (+) in the top-left corner of the Documents screen. The Basic template options (see the figure) will vary depending on which app you’re using. In Pages, for example, you can create a new Blank document, a Blank Landscape document, or a Note Taking document. You can also scroll down and tap on another document template on which to base your new document on, such as Modern Report or Project Proposal. Tap the template you want to use as a starting point, or tap Blank (Pages and Numbers) or Black or White (Keynote) to start working with a completely clean document. If you change your mind, you can tap Cancel and you return to the Documents screen. Your new document opens on the screen. Before long, you’ll have created several documents, and chances are good that you’ll want to go back and work on some of them or print them, e-mail them, or share them via iCloud. As with creating new documents, locating a document is done the same way in each of the iWork apps. The Documents screen appears. After you’ve created several documents, that screen looks like this figure. View the documents and find the one you want to work with. Below each document, you see its title and the date you last worked on it. Tap the document you want to work with. The document opens, and you can begin working in it.